Today, 1 Dec. 2014, a new special volume of the Journal of the Adelaide Botanic Gardens was published. Volume 28 of the Journal consists of one article: P.S. 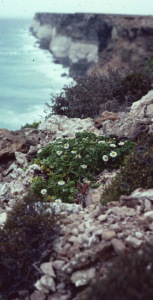 Short’s magnum opus, the revision of the Australian species of Brachyscome (Asteraceae). The 219 page article is the result of over 20 years’ of research. All Australian species of Brachyscome and related genera are reviewed. 17 new species and 4 subspecies of Brachyscome are described as new, totalling the number of species of the genus to 87. The new genus Roebuckia is split from Brachyscome. It is named after William Dampier’s ship, the Roebuck, which landed on the W.A. coast in 1699. Roebuckia contains 9 species, of which 5 species are new described, as well as 5 new varieties. The paper is illustrated with photographs and very detailed line-drawings of fruits by botanical artist Sue Wickison from New Zealand. The articles concludes with a large appendix, listing the character states for 87 morphological and other characters for all species discussed. This entry was posted in Publications on 1 December, 2014 by Jürgen.